Three cheers for Will Haskell, Government major and French minor, who graduated earlier this year and defeated a 22-year incumbent. At one door, the lady of the house spoke only French, allowing Will to win her vote in fluent French. Articles from Hartford Courant, Washington Post, Time Magazine and Georgetown's two student newspapers, the Hoya and The Voice. Hoya Saxa, Senator Haskell! My alma mater, Georgetown University, has sent forth another leader, part of our tradition since 1789. Officials say Democrat Will Haskell, a 22-year-old Georgetown graduate, claimed victory Tuesday night over Toni Boucher in the 26th Senate District. Haskell faced a monumental challenge in defeating Boucher, a popular moderate Republican from Wilton. The seat has been held by Republicans since the 1970s, though Hillary Clintonwon the district by 22 percentage points in 2016. “He outworked his opponent,” Westport democratic town committee chair Ellen Lautenberg said. Haskell’s campaign got a boost when he was endorsed by former President Barack Obama. He also was endorsed by Sen. Chris Murphy and state Rep. Jim Himes. Haskell ran an extensive ground campaign, hosting more than 120 meet-and-greets and knocking on thousands of doors in the district, which encompasses Westport, Weston, Wilton, Ridgefield, Redding, Bethel and New Caanan. Haskell, a 2014 graduate of Staples High School, graduated from Georgetown University in May after launching his campaign in March. He had planned to go to law school, but was inspired to run by President Donald Trump’s election win and his love of government. Boucher has served in the legislature for as long as Haskell has been alive. She has held the state Senate seat since 2008. She toyed with a run for governor this year, but decided to pursue another term in the state Senate instead. Boucher is a leader among Republicans at the state Capitol, co-chairing the education and transportation committees. Her moderate stance on social issues and her fiscal conservatism have made her an attractive candidate for Fairfield County, an area of Connecticut that typically votes Republican locally and Democratic during national elections. Boucher’s district gave Hillary Clinton a 22 percent victory in the presidential race in 2016, a strong indication that moderate Republicans in the district were shifting more to the left. During his campaign, Haskell said he hoped that the voting trends would help him. He supported tolls to raise revenue for infrastructure and transportation and supported tougher gun laws. A 22-year-old Georgetown University graduate has defeated a Republican incumbent to win a seat in the Connecticut state Senate. Will Haskell, who announced his candidacy during his senior year of college, ran on a platform of toll roads and tougher gun control, according to the Hartford Courant. He defeated Toni Boucher, a Republican who has been serving in the state legislature since 1997 — almost as long as Haskell has been alive. Before running for office, Haskell worked in campaigns with Rep. Jim Himes (D-Conn.), Sen. Chris Murphy (D-Conn.) and Hillary Clinton, according to New Canaan News. Haskell was endorsed by former president Barack Obama and Sen. Chris Murphy (D). Haskel told the Mirror that former president Barack Obama’s farewell speech inspired him to seek office. It was a light bulb moment for Haskell when he heard Obama say, “If you’re disappointed by your elected officials, grab a clipboard, get some signatures, and run for office yourself.” Those words are even inscribed at his campaign office, a recently shuttered local Chinese restaurant with no heat where he works alongside high school volunteers. Before he ran for office, Haskell was an intern at Business Insider, and he had been published in the Cut. His former boss and colleague celebrated his victory. With only two months left in his undergraduate career, Will Haskell (COL ’18) has set his sights on an ambitious new job: Connecticut state senator. Haskell declared his intent to run as a Democrat for the state Senate seat March 1. A member of the Georgetown Chimes a capella group and the director of personnel at Hoya Snaxa, the Students of Georgetown, Inc. convenience store, Haskell intends to defer his plans to attend law school at the Georgetown University Law Center to campaign before the election Nov. 6. Haskell said he was galvanized to run for office by the election of President Donald Trump in 2016. “This is a moment when our fundamental values — equality, justice, respect — they seemed suddenly, for the first time in my life, up for debate,” Haskell said. “I have the time this summer to be a full-time candidate. I’ll be knocking at doors every single day. And I think that really poses an opportunity to make a difference,” Haskell said. 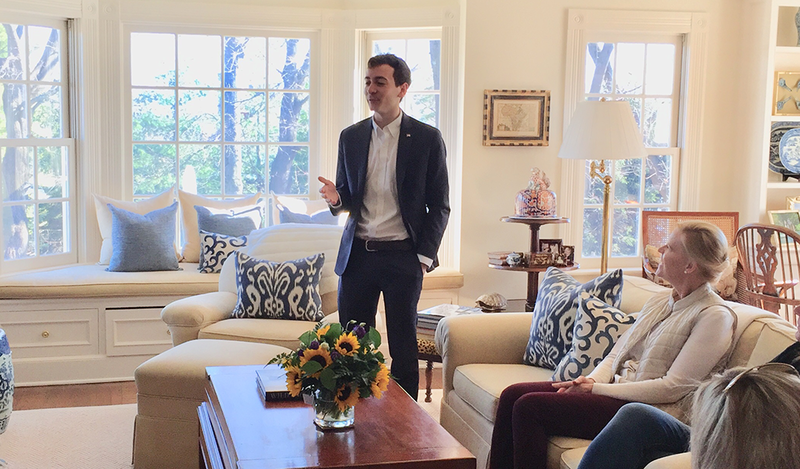 Georgetown undergraduate Will Haskell (COL ’18) campaigned door-to-door over spring break after launching his bid for the Connecticut state senate. Lynch said his team has prepared a robust strategy for the work they will do while still students. “In the meantime, we have plenty of work to do from here at Georgetown, including fine-tuning our budget, building our social media platforms, and all sorts of long-term strategy and planning,” Lynch wrote in an email to The Hoya. Haskell is competing for a seat held by Republican State Senator Toni Boucher since 2008. In the 2016 election, Boucher defeated her Democratic challenger by 20 percentage points, according to Ballotpedia. However, Republicans do not dominate the state government; Connecticut is one of eight states where Democrats control both the legislature and the governorship. Haskell’s previous political experience includes interning for former Secretary of State Hillary Clinton’s 2016 presidential campaign, interning in the Capitol Hill offices of Rep. Jim Himes (D-Conn.) and Sen. Chris Murphy (D-Conn.) and researching voter protection laws for the Democratic National Committee. Haskell acknowledged his age could be perceived as a weakness, especially when contrasted with Boucher’s experience, but said his youth can bring a new perspective. Haskell is not the only young Hoya running in this year’s midterm elections. A recent Georgetown alumna, 26-year-old Democrat Shavonnia Corbin-Johnson (SFS ’14) is running for U.S. Congress in Pennsylvania, and recent graduate Kyle Rinaudo (SFS ’17) is running as a Democrat for the Georgia state House of Representatives. Boucher announced an exploratory bid for governor in September, according to the Hartford Courant. She participated in a bipartisan gubernatorial debate March 11, but could not debate at the Republican gubernatorial debate Feb. 21 because she had not officially declared her candidacy. However, Haskell said he expects to run against Boucher in the state Senate race. “My opponent’s sort of perennially running for governor. She does this every four years. And I think based on previous experiences, she’ll spend some time criss-crossing the state, and then she’ll come back to our district eventually when that doesn’t work out,” Haskell said. Boucher did not respond to requests for comments as of press time. Haskell’s policy platform addresses three main areas: strengthening gun control regulations, improving infrastructure and building a more robust economy. Haskell expressed support for banning bump stocks, cracking down on unregulated gun sales, investing in transportation initiatives like faster trains with Wi-Fi and diversifying Connecticut’s workforce by attracting college graduates with tax credits. Haskell contrasted his platform with Boucher’s, which he characterized as increasingly right-wing. Lynch, who has been roommates with Haskell since freshman year, said he has full confidence in his candidate’s political motives and platform. Initially concerned with raising enough funds for his campaign on time, Haskell said his campaign raised $15,000 three days after announcing his bid March 1. As of March 13, Haskell’s campaign had raised about $25,000. More than 100 students have donated to his campaign, “which means a lot, because you know and I know students don’t have much money to spare,” Haskell said. Although he is unsure of his long-term plans apart from eventually attending law school, Haskell confirmed his commitment to his home state. 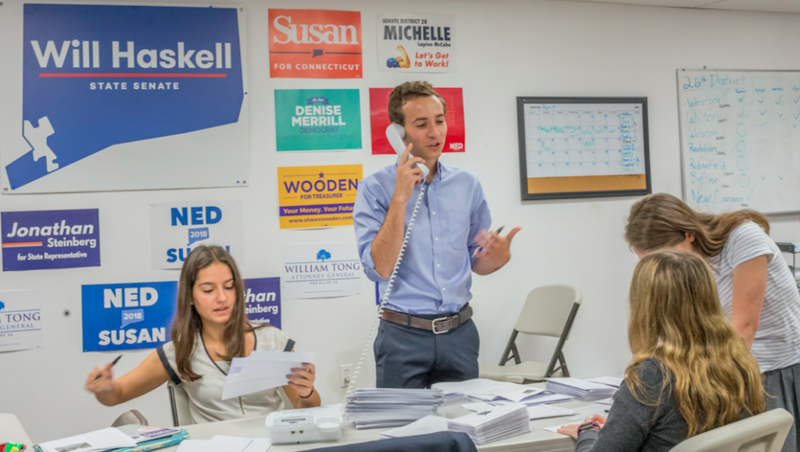 After graduating in May, Will Haskell put his plans to attend Georgetown Law School on hold to vie for a seat in the Connecticut State Senate, representing the 26th district. That state Senator, Antonietta Boucher, is now Haskell’s opponent. Boucher has held the seat since 2009 and has a long tenure in state politics, including 12 years in the Connecticut House of Representatives. Boucher has publicly defended her record on guns, as she voted for sweeping gun-control legislation in the wake of the Sandy Hook shooting and was recognized by Moms Demand Action for Gun Sense in America as a “gun sense” candidate, a distinction Haskell also received. Boucher could not be reached for comment before press time. Discontented, Haskell wanted to volunteer in support of Boucher’s future opponent, but soon found that the Democrats lacked a challenger for her. “The response I heard was, ‘Oh, you know, she’s been in office for 22 years, she’ll probably be there another 22 years. Nobody runs against her,’” Haskell said. Throughout his campaign, Haskell has used his government degree—and even his French minor. “I was door knocking, there was a lady who spoke only French, and I was able to give my whole stump speech. That made the minor worth it,” he said. Haskell’s time on the Hilltop prepared him in less traditional ways, too. He believes his four years working at the Corp’s Hoya Snaxa fostered the interpersonal skills vital to a campaign. After graduating, Haskell moved back to his district and into an apartment in New Canaan, Connecticut. Still living with his old roommate Lynch, he set about trying to unseat the five-term incumbent with a political career as old as he is. That would be no easy task. Her history of landslide victories in a seat that has been held by Republicans since Richard Nixon was president would be discouraging to most, but Haskell believes that he is different. While running for office can be expensive, Haskell has avoided this by publicly financing his campaign. To use public funds, Haskell had to raise $15,000 to give to the state, and in return he received an $85,000 grant. Despite raising over $100,000 in her last three elections, Boucher also opted for public funding this cycle, meaning the candidates will have the same amount of money at their disposal. On top of public funding, Haskell received additional help—the endorsement of former President Barack Obama. An intern originally suggested that Haskell contact Obama about a potential endorsement. “I said you know what, maybe we can write him a letter, and then a few weeks later we heard that I was being endorsed, which totally blindsided me. It was so exciting and it is really an honor,” Haskell said. Obama tweeted his endorsement of Haskell on Oct. 1, alongside 259 other candidates for state and federal offices. Sens. Chris Murphy and Richard Blumenthal and Rep. Jim Hines endorsed Haskell, as well as Planned Parenthood, Run for Something, and the National Organization of Women. Haskell emphasized that he is always trying to reach the voters in the district and has a daily goal to knock on 40 doors. He also has volunteers participating in “days-of-action” on the weekends. As a young candidate, Haskell has had his age used against him by some, while other voters do not see it as a negative. At a joint candidates forum, when a Republican candidate for state representative mentioned his recent graduation from college while criticizing Haskell, the audience drowned him out with boos. Haskell said that young people will not want to move back to Connecticut until the state invests in advancing its cities, bettering its infrastructure, and creating an “exciting” economy. His top priority in attracting young workers to the state is paid family leave. Haskell still carries Georgetown with him, both the memory of the outpouring of support when he launched his campaign and the continued help from the community. “I have been obsessing for the last few months about how exactly we are going to spend this time between now and election day, and I really am not sure what is in store for me afterwards,” Haskell said. After Nov. 6, Haskell will have either won or lost. But for now, he can only think about the present. Campaigns rely on young volunteers to do the legwork needed just before the election. But the candidates they are working for are often much older. That’s not the case in Will Haskell’s campaign, which won a bid to unseat veteran Republican state Sen. Toni Boucher on Tuesday. The 22-year-old Georgetown graduate ran to unseat Republican state Sen. Toni Boucher, who has been in office for as long as Haskell has been alive. And Haskell did it by relying on an army of teen- and college-aged volunteers to knock on doors, hand out fliers and call potential supporters. Although he’s young, Haskell is no political newcomer. He has worked for the Democratic National Committee, campaigned for Hillary Clinton in the 2016 presidential election and interned for Rep. Jim Himes and Sen. Chris Murphy. He said he came back to his hometown after President Donald Trump’s election win and found he disagrees with many political views of Boucher, who represented his home district. He realized that no one was planning on challenging her and then decided he would run. About one in three volunteers who worked for Haskell’s campaign were either high school students or in their early 20s, the 22-year-old campaign manager Jack Lynch said. Haskell’s campaign reflected a trend of young people getting involved in politics for this election season. According to Catalist, a voter data organization that works on the left, youth turnout rates among early voters were up 125% compared to the last midterms in 2014. Statewide, the voter registration between ages of 18 to 24 has more than doubled for the 2018 election cycle compared to four years ago, according to the Connecticut Secretary of the State office. Kaila Finn, a 20-year-old writer for the campaign, recalled that she saw Haskell’s campaign ad on Facebook and was moved by his message about criminal justice reform and education and equality. She said she became more involved after finding out about bills like the Times Up Act, which aims to protect people from workplace harassments and assaults, died on the Connecticut House floor. Finn said she was also frustrated by many elected officials’ efforts to undercut bills and felt the current policies on issues like women’s rights are not progressive enough. She decided to “go full steam ahead” with the campaign for Haskell, whose policy proposals focus on areas like paid family leave, gender wage gap and workplace harassment.